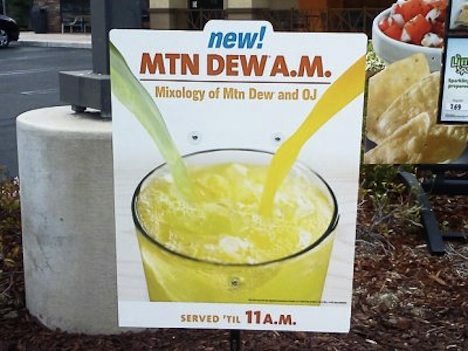 Taco Bell has announced it’s adding a new breakfast soda drink – Mountain Dew A.M., a mix of Mountain Dew and Tropicana orange juice – to its breakfast menu. Just in case you’d like a toothache first thing in the morning. The beverage joins the A.M. Crunchwrap on Taco Bell’s new breakfast menu “FirstMeal”, which was introduced earlier this year at over 800 restaurants in 14 states. The Crunchwrap is filled with scrambled eggs, cheese, hash browns, and bacon or sausage all rolled up in a tortilla shell. While it’s not surprising to see the Mexican-style chain roll out a few breakfast items, it’s a little disturbing to see such a sugar-filled drink on the morning menu. The only justification I have for something like this is when you’re leaving the bar very early in the morning (think 3:00 a.m.) and want some breakfast before going to bed for the rest of the day. That’s the only time it’s OK with me to make the decision to drink this. At this point in the fast food game, doesn’t it sound a little regressive to introduce a product like this? I mean, even McDonald’s and Burger King are supposedly cleaning up their menus a little and introducing healthier items and business practices. Taco Bell recently introduced their “Cantina Bell” menu which boasts healthier items, so I’m a little surprised that they aren’t finding a healthier breakfast drink to offer. Apparently, the drink will only be offered at Taco Bell and is mixed in-store, but I have a feeling you can figure out the recipe. Would you drink something like this, or do you think it will be a flop?